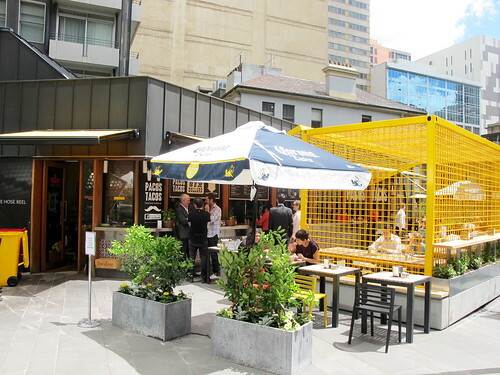 The Mexican wave of culinary invasion continues apace in Melbourne, with Team MoVida setting aside Spanish food this time and jumping on the taco bandwagon, in the outdoors kiosk across from MoVida Aqui that used to house MoVida Terraza. 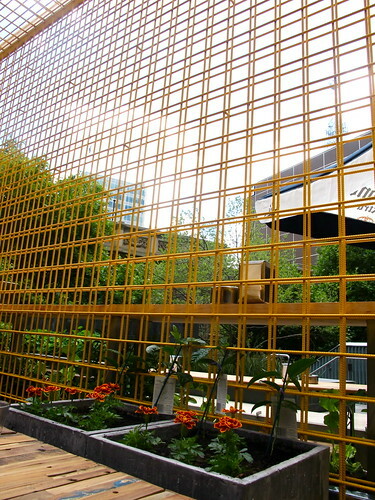 The redesign of the place was by Joost Bakker, which explains the vaguely Greenhouse-y feel of the cage wall, repurposed heavy timber tables and liberal use of greenery in flowerpots. As at the Taco Truck, the tacos are all $6 each. 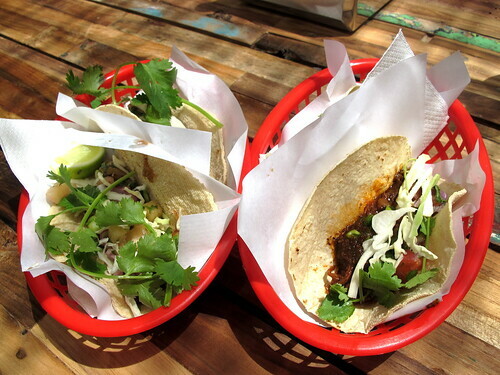 They're made from 100% corn tortillas and all come with coriander, cabbage and spring onions. There's a choice of pulled pork, braised beef, roasted duck, prawn, fish or vegetarian (pinto beans, guacamole, pico de gallo, queso and crema). When I went with Em on Thursday, we each tried one with carnitas (pulled pork and pineapple salsa) and one with carne asada (braised beef, chipotle and pico de gallo). Both kinds were pretty tasty, though we both felt that the sauce the beef was braised in was a little too acidic. In addition to the tacos there are a few other snacks on the menu, including one dish that sent my porkophile Twitter/Instagram followers into meltdown mode when I posted a photo of it online: chicharonnes. 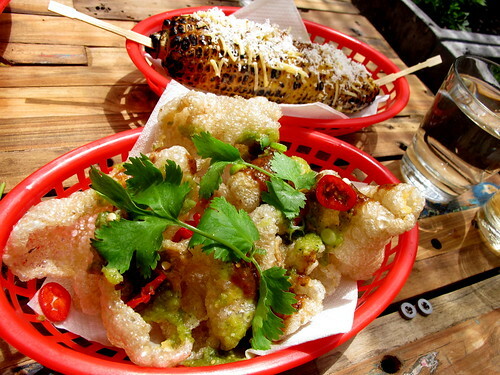 A $10, heart attack-inducing basket of crispy pig crackling with salsa verde, chipotle and lime. As sinfully delicious as it was, Em and I couldn't bring ourselves to finish our serve: if you can finish a basket, I don't know if that's a good thing or a bad thing. We also tried their version of elotes callejeros ($6), the grilled corn on the cob with cheese, spices and lime dish that keeps cropping up on restaurant menus in Melbourne and Sydney (see Mamasita, Newmarket, The Dip, Mexicano and Barrio Chino, plus some restaurants without a Latino focus, like St Katherine's and Ms G's). As with the version at Mamasita, the Paco's Tacos version uses chipotle mayo but the latter is longer, cheesier and more charred. For now, Paco's Tacos is closed on weekends, open for lunch during the week and only open for dinner on Thursdays and Fridays. 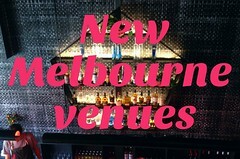 Hopefully that'll change as summer kicks into high gear, as the drinks menu includes several rum and tequila-based cocktails, plus sangria, beers (Moritz, Corona, Pacifico) with an optional tequila chaser, cider on tap, Jarritos soft drinks and even a shandy (!). Oh boy, the grilled corn looks good! And it's a healthy treat (ok proabably not very healthy with the cheese, but healthier haha) for a lovely day! This looks seriously delicious. 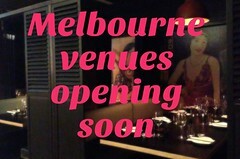 We hope it's as good as Mamasita, but without the queues! 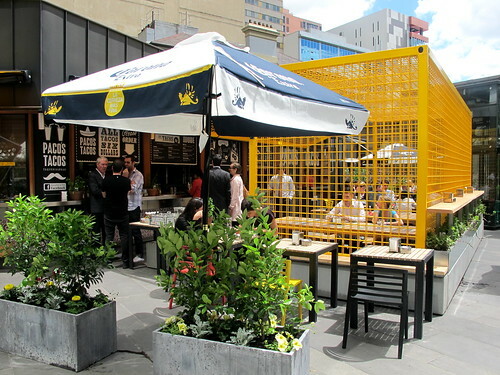 Curious - if you could take either Movida Terraza or Paco's Tacos which would you choose? Food and drinks are great. Pity that there does not appear to be any non smoking areas. Luckily nobody around me was smoking....but smelly ashtrays on the tables- UGH!! I read this today and HAD to have it for lunch. I went at the end of lunch (2.00ish) and there was no line. Had the corn, fish taco, and shrimp taco... Deeee-lish.